You can integrate itopia with your Zendesk account to get live data, ensuring your whole team has the customer information they need to provide excellent support. You can also send itopia information to Zendesk, for example organizations, users and tickets. 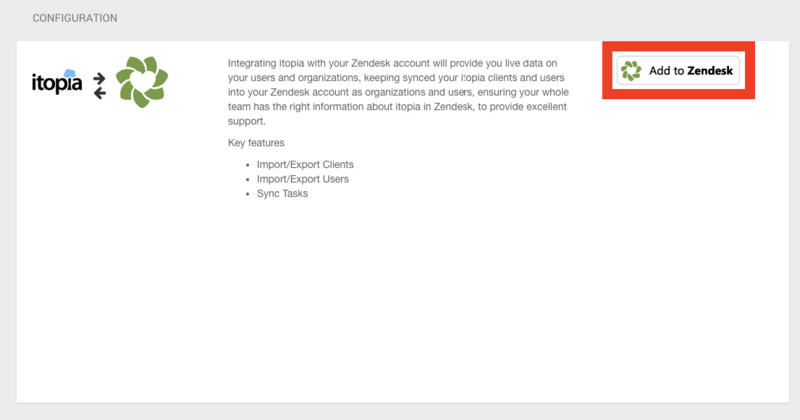 Get the context you need to provide better support with itopia data in your Zendesk account. You can easily choose what information from itopia you want to forward to Zendesk, like Companies (to create deployments), Users and Tasks, to ensure your teammates are kept informed. 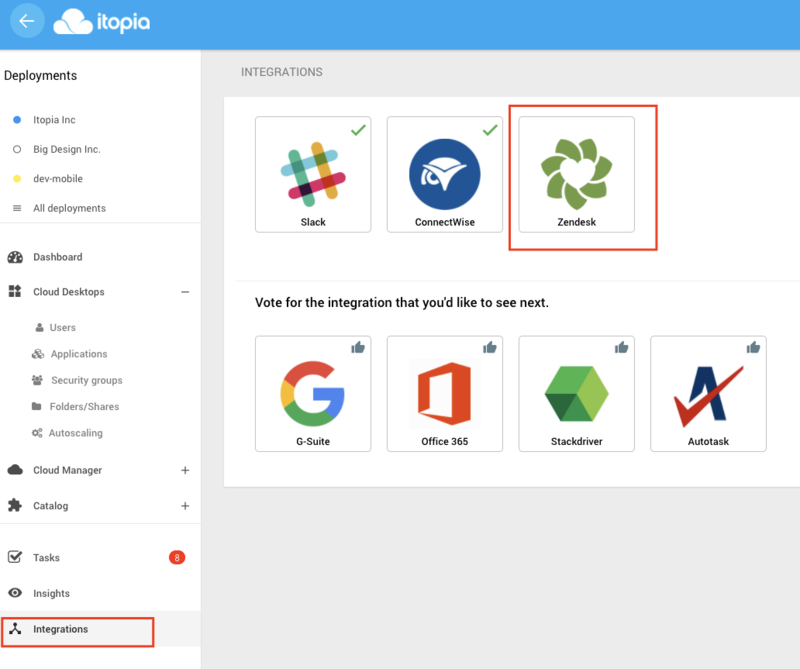 If you’re a user of our Starter, Professional or Enterprise plans, try out itopia’s integration with Zendesk in your account! Open “Integrations” module from itopia main menu and just click on “Zendesk” icon. Type your Zendesk administrator email address, Zendesk API token, and Zendesk app name as suggested in the next screen and hit “Complete Integration”. You'll have to click on the + sign to create a new token number and copy it right away since you will not be able to get it again after closing the window. You can then give the integration a name and hit Save. Next, you will get few setting options that you can configure. Once you finish, click on “Save”. Your Zendesk account will be now integrated with itopia so you can begin managing Clients' Informations through Zendesk. 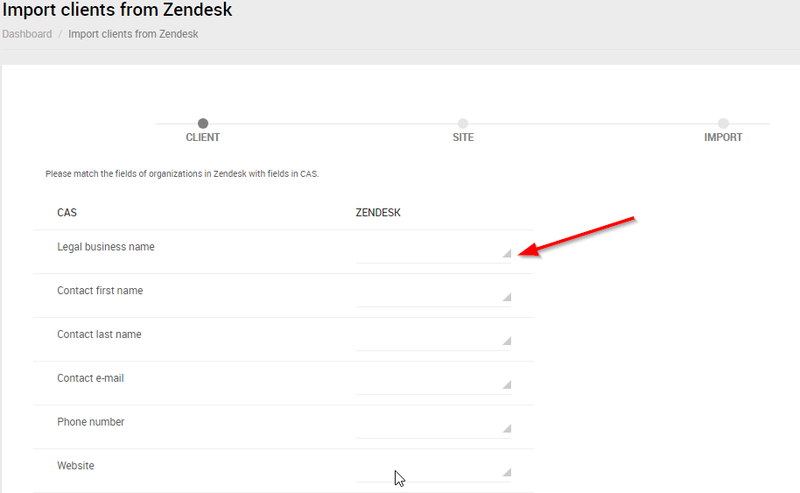 There are some features you can enable/disable in the Zendesk Integration Settings. If New Task is enabled all tasks generated by itopia will be posted in your Zendesk account as Tickets. 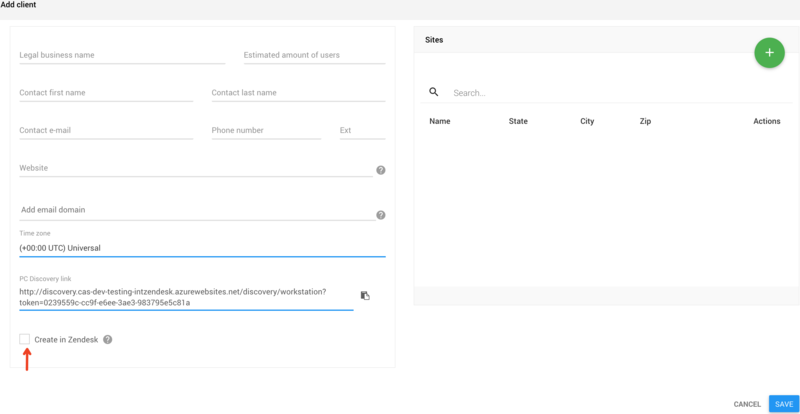 If enabled, you'll notice that a new field will appear in the deployment creation form, which will let you choose if you want to create the new client in Zendesk as Organization. If Create User is enabled, a new field "Create in Zendesk" will appear in the Create User form, which will allow you to create the user in Zendesk as well. If Launch User is enabled, the behavior is similar to Create User feature, but in this case the "Create in Zendesk" field will appear in the confirmation popup required to send a user to the cloud. When you want to import already existing Organizations from itopia to Zendesk, so they are created there as Clients, you can do so going to All Deployments dashboard. 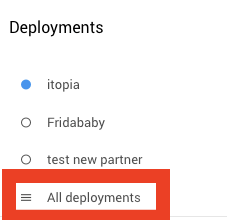 Choose "All Deployments" on the left, then hover over the green plus sign in the right side of the pop up so the extra options show up and choose "Import from Zendesk"
You'll get the following screen where you will associate the mandatory fields that itopia needs for client creation with Zendesk Organization fields. Hit Next to continue and the system will list all the organizations that are missing some of the mandatory fields for you to complete them. 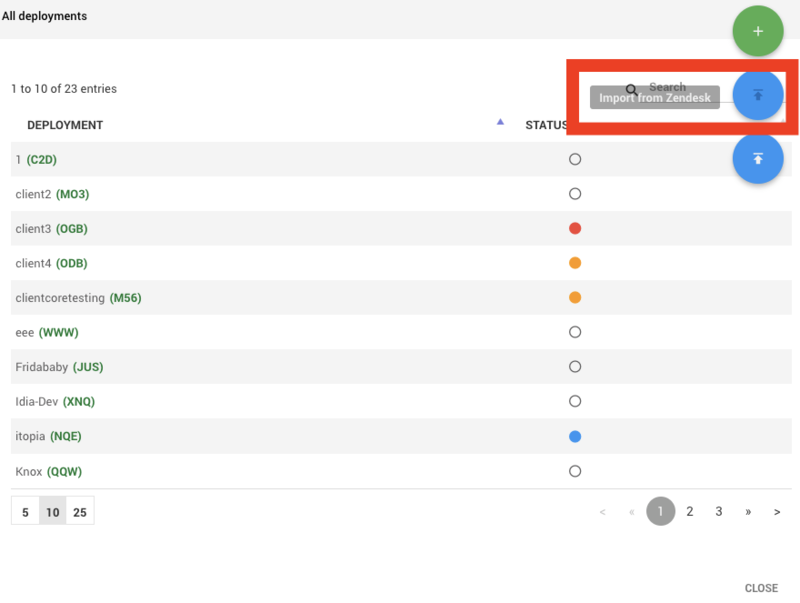 Import Users: Similar as above, to import existing users from Zendesk to itopia, you will go to Users module and hit the 3 dots in the top right. Select Import from Zendesk option. You will associate itopia user fields with Zendesk and hit Next. The list of users that will be imported will pop up. 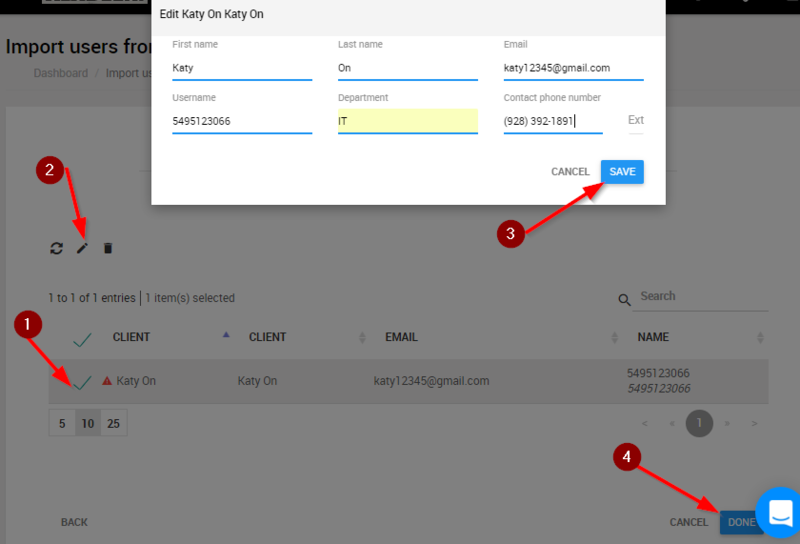 The system will only get users that have the same email domain as is the Client's. Those with the red mark have one of the mandatory fields missing. You can edit all user fields, just select the user and click on the pencil icon. When users are ready, hit Done. Close task upon ticket resolution: The ticket created from a Task in itopia will automatically complete the related task once it's closed. Have a look at our Slack Integration and how to configure it.